The country’s largest waste hauler, Waste Management, achieved a milestone this summer as it put its 1,000th natural gas refuse truck into service. 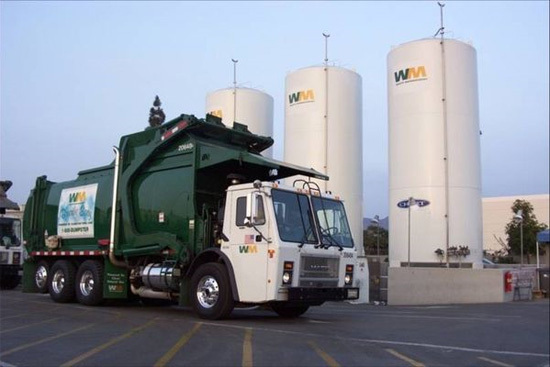 Even more promising, Waste Management’s newest trucks in California are running on the renewable form of natural gas, called biomethane, that requires no drilling since it is produced by collecting and refining the methane gas created at the company’s Altamont Landfill. The Altamont Landfill has been in operation since 2010 and is the world’s largest landfill site producing biomethane. By purifying and liquefying landfill gas into renewable biomethane fuel, Waste Management and its partner Linde North America have been able to produce 13,000 gallons a day of renewable natural gas that is fueling more than 300 refuse vehicles. Altamont has been such a success, that Waste Management is searching for a new site in southern California to convert landfill gas into biomethane. And to think that these trucks would have to run on diesel if they didn't have landfill to make the gas. Landfilling is still far cheaper than recycling in terms of it's costs on municipalities and counties. And this the debunks the myth that landfill capacity is declining in America; far from it, capacity is practically (for lack of a better word) infinite. A real myth is that recycling is an economically viable activity.............while really it offers mainly short-term benefits to a few groups-politicians, public relations consultants, environmental organizations, waste-handling corporations-while diverting money from genuine social and environmental problems. In the past businesses were already recycling millions of tons of trash a year. They were voluntarily and profitably recycling newsprint, office paper, cardboard, aluminum and steel or anything that they could benefit from and reuse themselves. By the 1980's politicians across the country had bigger ideas. State and city officials enacted laws mandating recycling and setting arbitrary goals. Municipalities followed the Waste Hierarchy by building waste-to-energy incinerators and starting thousands of curbside recycling programs-all in the belief that it would be cheaper than landfilling. But the incinerators turned out to be disastrously expensive, and the recycling programs produced a glut of paper, glass and plastic that no one wanted to buy. So recycling devotees hit on a new solution: if people aren't willing to buy our precious garbage, we'll force them. The Federal Government and dozens of states passed laws that required public agencies, newspapers and other companies to purchase recycled materials that they never wanted in the first place bolstered by a variety of tax breaks and subsidies, have pushed recycling into the American conscious as a success.